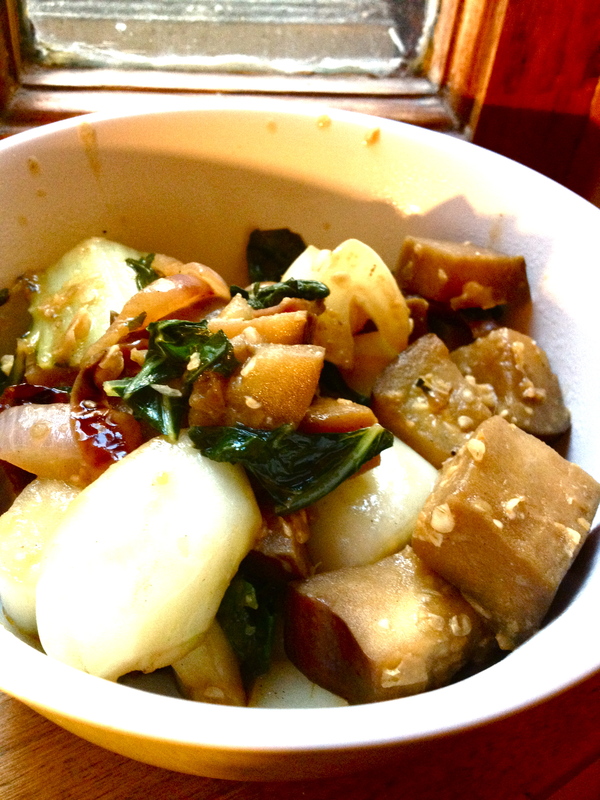 Miso Sesame Bok Choy and Eggplant Stir Fry – .rebel grrrl living. The box was full of awesome goodies including eggplant and bok choy. It’s rare that I attempt to do Asian-inspired dishes, mostly because there are cooks in restaurants that do it much better, and I like supporting them. That being said, inspiration struck and I went for it. These vegetables + my neglected jar of miso paste = this awesome stir fry. Like most stir-fry dishes, this was very easy to make, but it does require some fancy oils. Fortunately, I had these on hand. If you don’t, I say it’s worth the purchase because they last forever and can be used in lots of different recipes. I try to avoid too much grain, so we skipped the rice, but if you’re not worried about grains, I know this would taste delicious with jasmine or brown rice. In order to hearty-it-up without rice, we added raw cashews on top. SO GOOD! Chop your vegetables in bite-size pieces. Put a drizzle of sesame oil in a wok or large pan and begin to saute your onions. 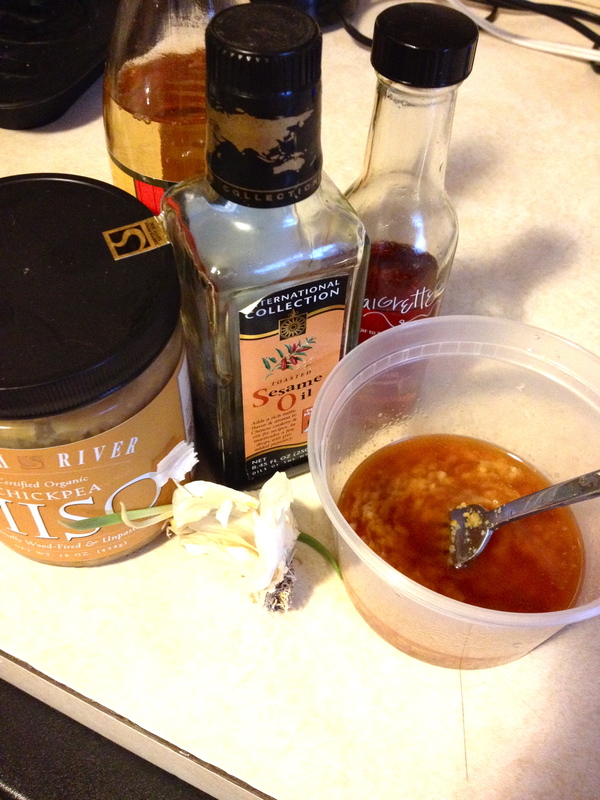 Meanwhile, create the rest of the sauce by whisking all of the ingredients in a bowl. 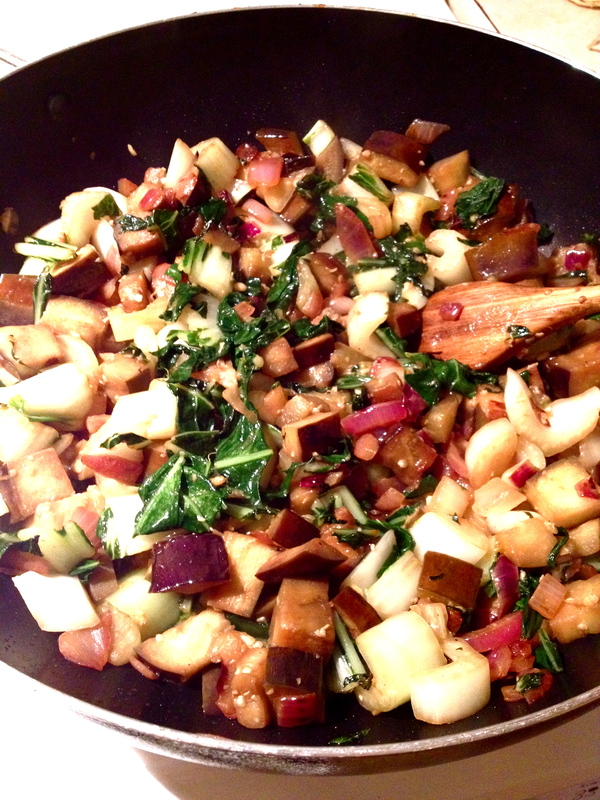 Stir in the rest of your vegetables and stir until greens are wilted and eggplant is browned. Add your sauce and stir together. Serve in a bowl. Add rice if desired. And/or top with raw cashews. Is there a kind of food you tend to avoid cooking because you know restaurants can do it better? Great recipe! Lucky you getting your friend’s CSA box. I’ve always wanted to try chili oil. I’ll have to pick some up next time I see it! It’s a nice thing to have around! Pingback: Simple End of Summer Italian-Style Roasted Veggies | .the rebel grrl kitchen.